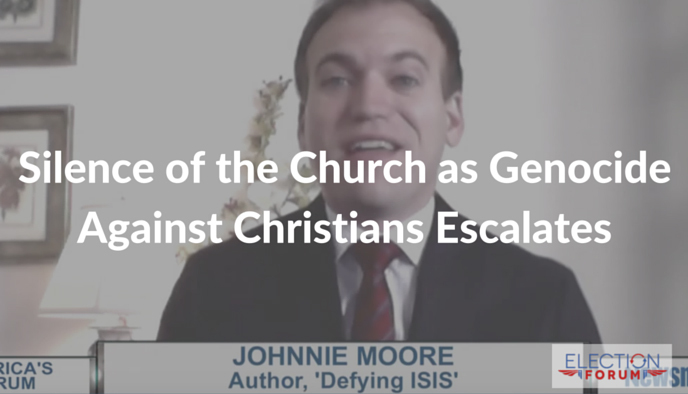 Listen to Johnnie Moore call out for unity among the Body of Christ. “It’s getting too late,” Johnnie Moore fears. Psalms 82:3-4 — DEFEND the poor and fatherless: DO JUSTICE to the afflicted and needy. DELIVER the poor and needy: RID THEM OUT OF THE HAND OF THE WICKED. Ezekiel 3:20 — Again, When a righteous man doth turn from his righteousness, and commit iniquity, and I lay a stumblingblock before him, he shall die: BECAUSE THOUGH HAST NOT GIVEN HIM WARNING, he shall die in his sin, and his righteousness which he hath done shall not be remembered; but HIS BLOOD WILL I REQUIRE AT THINE HAND. One of the requirements of Christianity that makes Christianity extremely challenging for those of us often fearing earthly threats more than we fear and love God, is the requirement of Christianity that has functionally been forgotten in post-1800s America as evidenced by America’s emaciated and God-offending condition. This requirement being what the Word of God makes crystal-clear, that if we have TRUE FAITH, AS OPPOSED TO ASSUMED FAITH, godly ‘works’ evidencing faith will overwhelm love and fear of the world. Pre-1900s Christianity more often understood that “faith without works is dead” by engaging in godly ‘works’ at the expense of their own security ensuring Christ was represented in society and government. Many men driven by a biblical teachings gave up their homes, property, money, and lives ensuring you could read this post today. With the exception of those killed in military actions, 1900-2016 Christianity generally evidences that ‘faith without works is alive’ by the fact that what little ‘works’ are engaged in commensurate with those biblically required to ‘rid the unborn and needy out of the hand of the wicked’ and generally represent Christ to the exclusion of evildoers. The sad truth of the matter is that, had all but a few of those populating today’s pulpits and churches today populated the pulpits between the years 1620-1900, America would likely have remained under European rule and slavery may have remained illegal. This, because it was the pulpits applying the Word of God to the obligation to aid the needy and oppose evil which ultimately catalyzed the creation of America – and today’s pulpits rarely call for opposition to evildoers. Stating Muslim-extremists slaughtering non-Muslims is anything other than ‘slaughter’ is to minimize the extent of these heinous murders. In this vein, it is equally important to state that the approximately 3500 (PER DAY) unborn children who are victims of abortion are slaughtered by BOTH the women having their babies aborted, AND THE MEN NOT LOVINGLY ENGAGING IN ALL POSSIBLE LEGAL ACTIONS TO PREVENT SUCH ABORTIONS. Granted, the approximate 3500 unborn children murdered per day are murdered for entirely different reasons than the approximately three (3) murdered per day in 2012 by Muslim-extremist. But this fact is of far less relevance then is the matter of prioritizing the distribution of resources required to end mass slaughter in one’s own nation before investing resources in aiding other nations. This, because as citizens we participate in the evils of our nation that we do not oppose. Being as GOD JUDGES people in the afterlife and NATIONS IN THIS LIFE, we may want to consider the extent to which America begs for God’s judgment before expending resources attempting to remedy horrific events in other nations. Do we really think that America’s change in trajectory from prosperity to national-suicide post 1800s, which is in a near linear relationship with Christianity increasingly failing to represent Christ in society and government, is a matter of God’s will? The answer is no. It’s a matter of the change in Christianity from a faith producing ‘works’ to the glory of God and to evidence faith is true and not assumed, to a religion with an imbalance a focus on what God does/will do for Christians. Time to focus resources on remedying the heinous actions within America begging God to allow destruction to be brought upon our own children and grandchildren, instead of diverging resources to the rest of the world.